, an eminent English antiquary, was born at Canterbury, March 30, 1606, according to the account given by his wife and son; but, according to the register of the parish of St. Margaret’s, much earlier, for it represents him to have been baptized Nov. 5, 1598. It was a proper birth-place for an antiquary, being one of the most ancient cities in England; and Somner was so well pleased with it, that, like Claudian’s good old citizen of Verona, within the walls, or in the sight of them, he grew up, lived, and died. He was of a reputable family; and his father was registrar of the court of Canterbury under sir | Nathaniel Brent, commissary. At a proper age he was sent to the free-school of that city, where he seems to have acquired a competent knowledge of the Latin language at least. Thence he was removed, and placed as clerk to his father in the ecclesiastical courts of that diocese; and was afterwards preferred to a creditable office in those courts by archbishop Laud. His natural bent in the mean time lay to the study of antiquities; and he took all opportunities of indulging it. He was led early, in his walks through the suburbs and the fields of that city, to survey the British bricks, the Roman ways, the Danish hills and works, the Saxon monasteries, and the Norman churches. 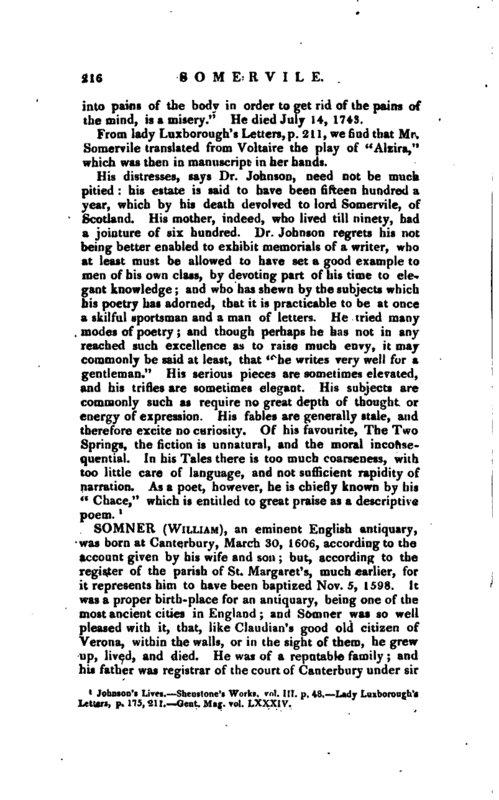 This was his amusement abroad; at home he delighted in old manuscripts, leger-books, rolls-and records; his knowledge of which was such, that upon questions concerning descent of families, tenure of estates, dedication of churches, right of tithes, and the history of use and custom, he was consulted by all his neighbours. In 1640 he published “The Antiquities of Canterbury,” 4to; an accurate performance, and very seasonably executed, as it preserved from oblivion many monuments of antiquity, which were soon after buried by civil discord iti ruin. This work obtained a high character; and Dr. Meric Casaubon, prebendary of Canterbury, and a great encourager of our author in his studies, represents it as “exceedingly useful, not only to -those who desire to know the state of that once flourishing city, but to all that are curious in the ancient English history.” It was reprinted in folio, with cuts, and revised and enlarged by the editor, Nicholas Batteley, to which he added a second part, of his own composition. Thus far Somner had searched only into the Latin writers, and such national records as had been penned since the Norman conquest: but his thirst after antiquities urged him to proceed, and to attain the British and Saxon tongues. To acquire the British, there were rules of grammar, explications of words, and other sufficient memoirs, besides the living dialect, to guide a man of industry and resolution; but the Saxon was extinct, and the monuments of it so few and so latent, that it required infinite courage as well as patience. Encouraged, however, by his friend Casaubon, and being of an active spirit, he did not despair; but, beginning his work, he succeeded so wonderfully, as to be compared with the most knowing rn that way: and he has always been ranked by the best | judges among the few complete critics in the Saxon language. His skill in this obliged him to inquire into most of the ancient European languages; and made him also go through the Old Gaelic, Irish, Scotch, and Danish dialects, and yet more particularly the Gothic, Sclavonian, and German. Of his perfection in the latter he gave the world a public specimen on the following occasion. 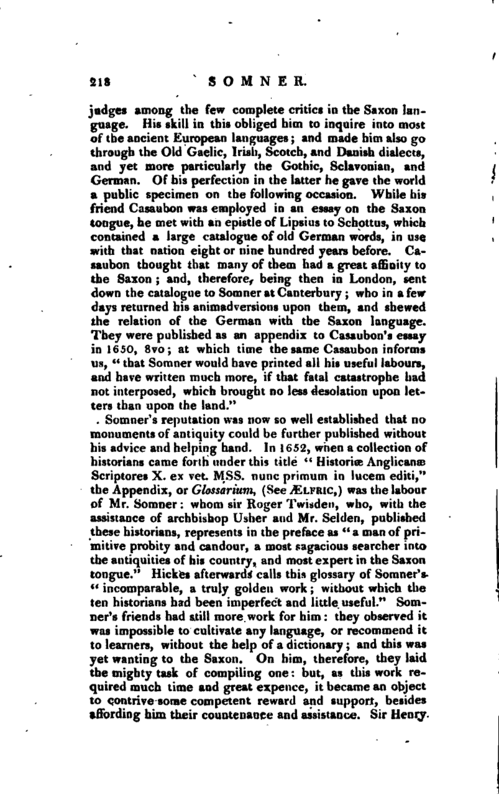 While his friend Casaubon was employed in an essay on the Saxon tongue, he met with an epistle of Lipsius to Schottus, which contained a large catalogue of old German words, in use with that nation eight or nine hundred years before. Casaubon thought that many of them had a great affinity to the Saxon; and, therefore, being then in London, sent down the catalogue to Somner at Canterbury; who in a few days returned his animadversions upon them, and shewed the relation of the German with the Saxon language. They were published as an appendix to Casaubon’s essay in 1650, 8vo; at which time the same Casaubon informs us, il that Somner would have printed all his useful labours, and have written much more, if that fatal catastrophe had not interposed, which brought no less desolation upon letters than upon the land." Somner' s reputation was now so well established that no monuments of antiquity could be further published without his advice and helping hand. In 1652, when a collection of historians came forth under this title “Histories Anglicanze Scriptores X. ex vet. Mss. 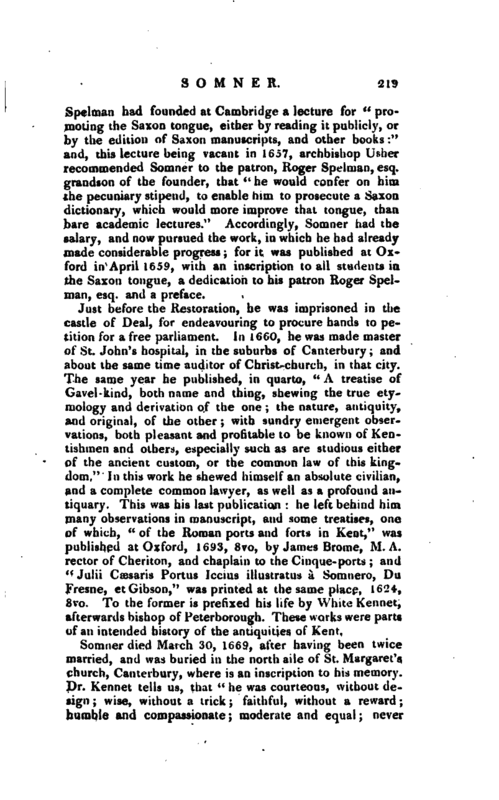 mine primuin in lucem editi,” the Appendix, or Glossarium, (SeeyEu-Ric,) was the labour of Mr. Somner: whom sir Roger Twisden, who, with the assistance of archbishop Usher and Mr. Selden, published these historians, represents in the preface as “a man of primitive probity and candour, a most sagacious searcher into the antiquities of his country, and most expert in the Saxon tongue.” Hickes afterwards calls this glossary of Sotnner’s “incomparable, a truly golden work without which the ten historians luid been imperfect and little useful.” Somner’s friends had still more work for him: they observed it was impossible to cultivate any language, or recommend it to learners, without the help of a dictionary; and this was yet wanting to the Saxon. On him, therefore, they laid the mighty task of compiling one: but, as this work required much time and great expence, it became an object to contrive some competent reward and support, besides affording him their countenance and assistance. Sir Henry | Spelman had founded at Cambridge a lecture for “promoting the Saxon tongue, either by reading it publicly, or by the edition of Saxon manuscripts, and other books:” and, this lecture being vacant in 1657, archbishop Usher recommended Somner to the patron, Roger Spelman, esq. srrandson of the founder, that “he would confer on him the pecuniary stipend, to enable him to prosecute a Saxon dictionary, which would more improve that tongue, than bare academic lectures.” Accordingly, Somner had the salary, and now pursued the work, in which he had already made considerable progress; for it was published at Oxford in April 1659, with an inscription to all students in the Saxon tongue, a dedication to his patron Roger Speiman, esq. and a preface. Just before the Restoration, he was imprisoned in the castle of Deal, for endeavouring to procure hands to petition for a free parliament. In 1660, he was made master of St. John’s hospital, in the suburbs of Canterbury; and about the same time auditor of Christ-church, in that city. 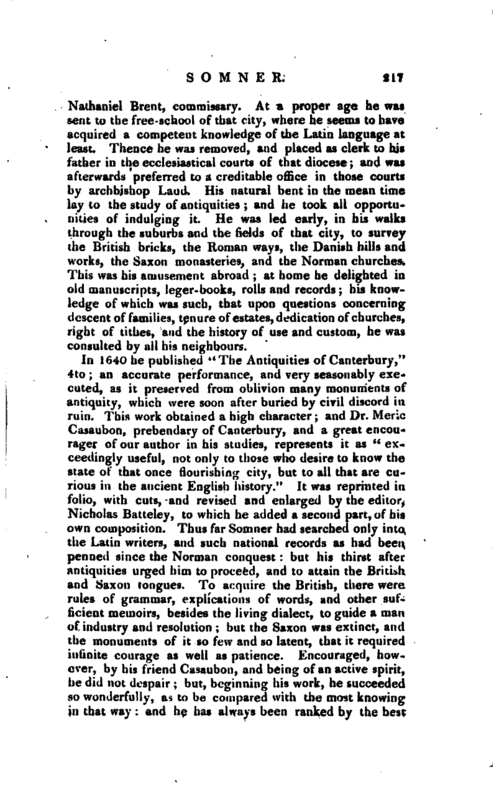 The same year he published, in quarto, “A treatise of Gnvel-kind, both name and thing, shewing the true etymology and derivation of the one; the nature, antiquity, and original, of the other; with sundry emergent observations, both pleasant and profitable to be known of Kentishtnen and others, especially such as are studious either of the ancient custom, or the common law of this kingdom.” In this work he shewed himself an absolute civilian, and a complete common lawyer, as well as a profound antiquary. This was his last publication: he left behind him many observations in manuscript, and some treatises, one of which, “of the Roman ports and forts in Kent,” was published at Oxford, 1693, 8vo, by James Brome, M. A. rector of Cheriton, and chaplain to the Cinque-ports and “Julii Caesaris Portus Iccius illustratus a Somnero, Du Fresne, et Gibson,” was printed at the same place, 1624, 8vo. To the former is prefixed his life by White Kennet, afterwards bishop of Peterborough. These works were parts of an intended history of the antiquities of Kent. Somner died March 30, 1669, after having been twice married, and was buried in the north aile of St. iMargaret’s church, Canterbury, where is an inscription to his memory. Dr. Kennet tells us, that “he was courteous, without design wise, without a trick faithful, without a reward humble and compassionate moderate and equal; never | fretted by his afflictions, nor elated by the favours of heaven and good men.” Of his “Saxon Dictionary” he says, “For this, indeed, is a farther honour to the work, and the author of it, that it was done in the days of anarchy and confusion, of ignorance and tyranny, when all the professors of true religion and good literature were silenced and oppressed. And yet Providence so ordered, that the loyal suffering party did all that was done for the improvement of letters, and the honour of the nation. 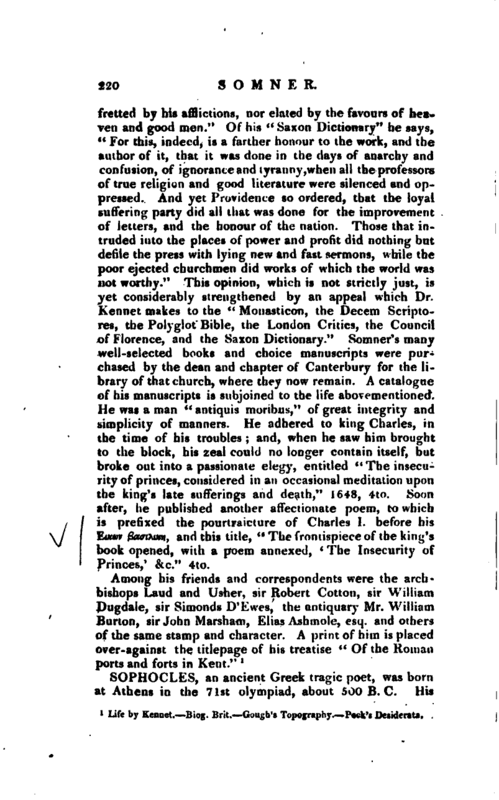 Those that intruded into the places of power and profit did nothing but defile the press with lying new and fast sermons, while the poor ejected churchmen did works of which the world was not worthy.” This opinion, which is not strictly just, is yet considerably strengthened by an appeal which Dr. Kennet makes to the “Monasticon, the Decem Scriptores, the Polyglot Bible, the London Critics, the Council of Florence, and the Saxon Dictionary.” Somner’s many well-selected books and choice manuscripts were purchased by the dean and chapter of Canterbury for the library of that church, where they now remain. A catalogue of his manuscripts is subjoined to the life abovementioned. He was a man “antiquis moribus,” of great integrity and simplicity of manners. He adhered to king Charles, in the time of his troubles; and, when he saw him brought to the block, his zeal could no longer contain itself, but broke out into a passionate elegy, entitled “The insecurity of princes, considered in an occasional meditation upon the king’s late sufferings and death,” 1648, 4to. Soon after, he published another affectionate poem, to which is prefixed the pourtraicture of Charles I. before his Ειχων βασιλικη and this title, “The frontispiece of the king’s book opened, with a poem annexed, ‘ The Insecurity of Princes,’ &c.” 4to. 1 Life by Kennet. Biog. Brit. Cough’s Topography, Peck’s Desiderata.